California Furnace was completely rebuilt by General Riachard K. Mellon in 1966. 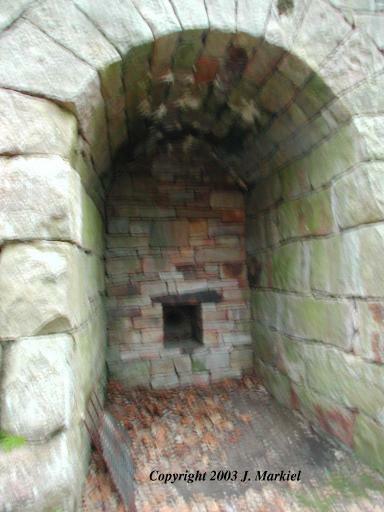 The furnace has two tuyeres, but the entire inner cupola has been bricked off. 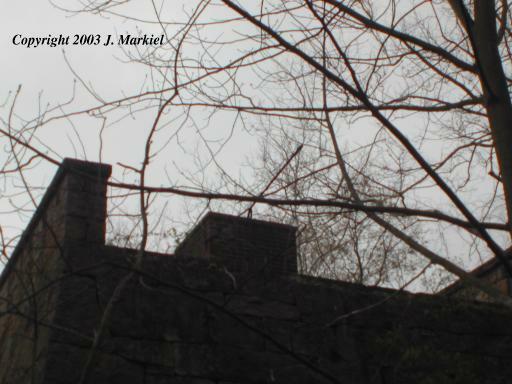 On the left hand side, the furnace abuts the mill race where a 40 foot water wheel drove a 25 foot leather bellows to provide the blast. 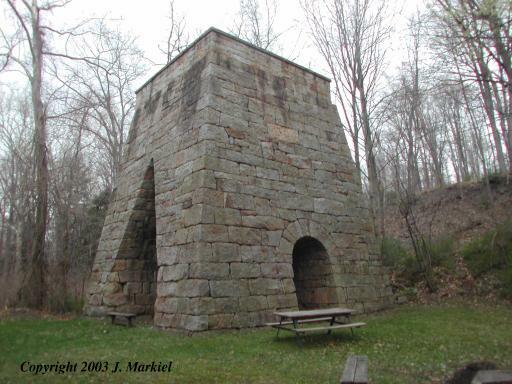 The use of such apparatus in 1850 indicates that the owners were not experienced furnace men, as newer furnaces built in this era were constructed as hot blast furnaces. 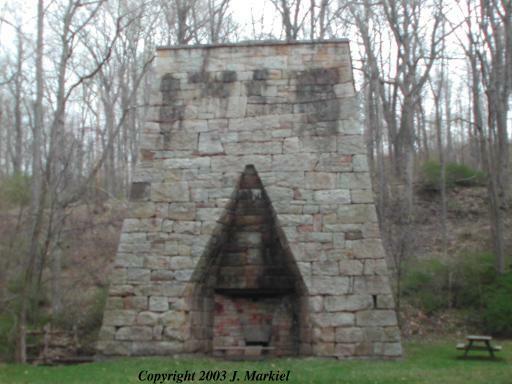 Additionally, many furnaces in this era operated with blowing tubs instead of bellows. The left hand tuyere has an excellent reconstruction of a tuyere hole. The furnace was originally built by Colonel Mathoit and his son-in-law, but they had the misfortune to start operations in the middle of a market depression. 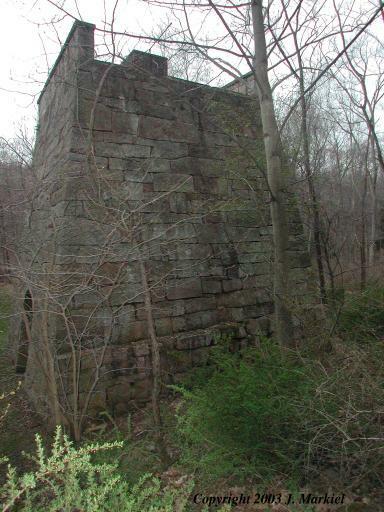 They sold the furnace in 1858 to Alexander Cavin. He spent a great deal of money on the furnace, but did not realize a return. He died of typhoid fever in 1862 and the furnace never operated again. 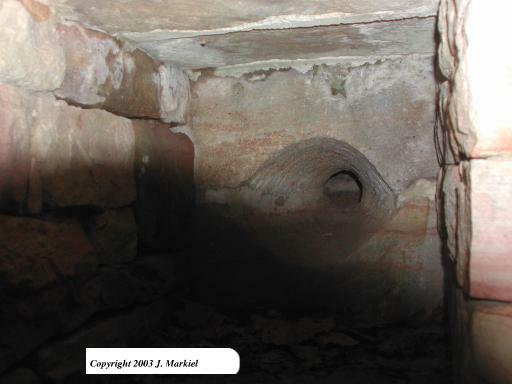 The old house located just south of the furnace was the boarding house for the furnace workers. Take PA 30 to Laughlintown. At the flashing light make a right hand turn and head south. At the top of the hill (country club will be on the right) continue straight. At the bottom of the second hill there will be a covered bridge to the left. Make a hard left, cross the bridge, and continue north (paralleling your initial entrance road). Go past the old house on the right and the furnace will be on the left approximately one mile from the bridge.